Possibilia is the proper name given to the territories of alethic space. It entails or is comprised of the regions Upper Possibilia, Lower Possibilia, Outer Possibilia and Inner, Left-spin Possibilia and Right-spin Possibilia. 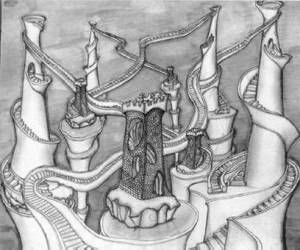 Only Excluding Metapossibilia (and the unreachable Citadel of Mechanicals’ Dreams), it has annexed the Republics of Absurdum, Factotum, Datum, Memorandum, Burlesque and Noir and even the Empires of Mage, Paralogician, and gods. Taken altogether, and incorporating vast wastelands of Altermath, the cities that line the banks of the river Lethe, and the Deserts of Unconducive Constants, all these regions might be called Greater Possibilia, though some rankle at the suggestion that there exists coherence to this broad domain.